These is probably Seiko’s most popular dive watches and for good reason. You get loads of high-end features for a very affordable price. Add to that the stunning dive watch look that is very much like the Rolex Submariner we all know and love and you have a match made in watch heaven. If you are looking at either of these watches, the SKX007 and SKX009, you might be wondering what the differences between them actually is? Is there a different movement inside the watch? Is the crystal the same? And, what are all those crazy letters anyway? SKX…. yeah, it can kinda get confusing. That is why in this post I am going deep into the SKX range and the difference between these two iconic Seikos. Below is a technical side by side comparison of the SKX007 vs SKX009, and you can quickly and easily see the that there is really no technical difference. What is good to know though is what exactly do these watches come with in terms of specs? This is where the main difference is with the SKXs in this review. 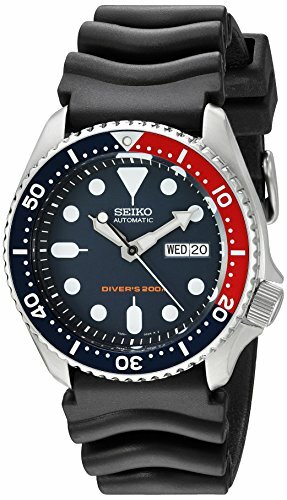 The SKX007 has a black dial with a black bezel, while the SKX009 has a dark blue dial and a blue/red (so called Pepsi) bezel. The rest of the face has typical dive watch characteristics like the large and often circular hour markers that make reading a watch while diving far easier. It also has large and well-lumed hands that are also easy to read when things get a little darker at depth. One quite unique part of this watch is the very pointy ends to the hands, which you might miss on first glance, but are quite cool. They may not help you tell the time more accurately, but they beat the standard tapered point that most watch hands have. The day/date function is less important when you are diving, of course. But it is also clear and well placed at 3 o’clock and can be set in a few languages in some versions of these watches. The bezel is again typical dive watch. It has large and easy to read numbers around the dial, every ten minutes. And something you don’t seen on every dive watch is clear minute markers at every minute. Most just have them in the first 10 or 20 minutes as this is the most oxygen critical time while diving. The SKX009 takes that a step further with the iconic Pepsi blue/red colors, with the red being the “danger” zone so to speak, when you seriously need to think about heading to the surface during a deep dive. It’s also a pretty cool way to stand out with a dive watch because most of them have one single, dial-matching color. Pepsi, ie. dual-color bezels are actually not very common. The SKX007 and 009 are both 42mm cases, so a little on the big side. However, being a dive watch it is not going to be slim and unobtrusive, that is just not how they fly (or swim?). It is also not the thinnest watch on the planet because it houses an automatic movement. The bezel is also well-raised and easy to grip with large serrated cuts for just this purpose. Everything is brushed stainless steel, to give a more laid-back yet classy look to the watch. The only really shiny bits, ie. polished, are when you turn the case over to study the back. But, given you will be wearing it most of the time, you won’t see this part very often. The 4 o’clock positioned crown is also a well-known element of the SKX range with the large flanges there to protect against anything catching. Another great feature of a well-designed dive watch. There are two main strap options for the SKXs. The first is perhaps the most common, the jubilee stainless steel bracelet that compliments the case perfectly. Of course, this makes the watch a little more of a dress watch, so it is not to everyone’s taste. Some people take the strap off completely and replace it with a NATO or Perlon strap, to turn the watch into something a little more casual. The other option that you can buy is another diver classic, the black rubber strap. To be honest, I am not a huge fan. It makes the watch look kinda cheap to me. But, if you are actually taking it diving, maybe it’s the perfect option. It doesn’t get wet. And doesn’t really require much cleaning, apart from a quick rinse to get the salt water off. The SKX watches are really dive watches. They are rated to 200m, which is the minimum dive certification and something you could actually take on a fairly standard dive. Remember, the number of the rating (200m) is not the depth you can dive to, it’s just how the test was conducted. The reality is often far far less. The screw down case back and crown are also a good sign of a well waterproofed watch, and the SKX comes with both. The dive-focused bezel with easy to grab sides and easy to read numbers (like the dial too) also make this an ideal dive watch. And, Seiko is really good at Lume, so you know this well be easy to read in low light. Just make sure it’s a little in the sun before you go diving. Lume is amazing, but it needs some help to get going. The 7s26 is one of Seiko’s workhorse automatic movements, but it does not mean that it is not worth your money. Considering you are paying just a few hundred for such a watch, it’s actually quite amazing you get automatic anything on a watch like this. It comes with over 40 hours of power reserve, which translates to almost 2 days without use. So, you may not need to buy a winder, unless you put it away quite often. There is no hacking or hand-winding either, which although a little disappointing, is not surprising at this end of the price range of Seikos. Well, I can’t decide for you, but personally I love the SKX009 because it stands out so much for a dive watch.The Pepsi blue and red bezel is almost a classic of Seikos these days and to own one is to own a piece of watch history. Of course, if you don’t want to stand out as much, then go for the SKX007. It will go with almost anything, and can be worn as a daily watch or a dress watch with absolutely no problem.